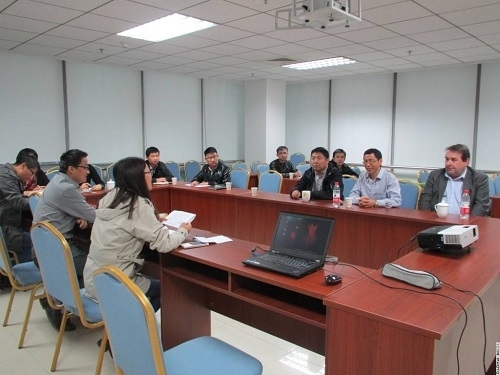 On October 20, 2015, Prof. Peter Clinton and Prof. Xue Jianming of New Zealand Forest Research Institute (Scion) along with Dr. Li Zhaojun, Research Fellow at the Institute of Agricultural Resources and Regional Planning (IARRP) of Chinese Academy of Agricultural Sciences (CAAS), paid a visit to the International Centre for Bamboo and Rattan (ICBR). They were shown to the International Bamboo and Rattan Showroom, and engaged in an academic seminar on related research areas. Researchers of the Institute for Resources and Environment of ICBR and the Institute for Green Economy of ICBR, as well as postgraduate students of related disciplines joined them for a discussion. At the seminar, Prof. Peter Clinton gave a presentation titled “Introduction to Scion and the Role of Forestry in Reducing Greenhouse Gases Discharge in New Zealand”. He briefed on forest resources in New Zealand and basic information about Scion, gave an analysis on the current state of forestry in New Zealand and related issues and solutions, and expanded on the role of forests in reducing GHG emission under the condition of global climate change. Prof. Xue Jianming gave a presentation titled “Ecological and Environmental Impacts of Long-Term Biosolids Application in a Pine Forest in New Zealand”. He talked about biosolid recycling and analyzed the application and environmental impacts of biosolids in pine forests in New Zealand. Dr. Su Wenhui, Associate Research Fellow of the Institute for Resources and Environment of ICBR, spoke on the topic of “Fast Growth and High Yield Techniques and the Ecosystem Stability for Bamboo Forest”. Based on the research and study of the research team in recent years, Su’s presentation focused on intensive bamboo cultivation methods centered on nutrient control and eco-management as well as latest developments in this area. At the seminar, researchers of ICBR and visiting experts conducted in-depth discussions on the nutrient cycle of forest ecosystems, efficient utilization, and issues regarding the improvement of comprehensive functions of forests.